Powers/Abilities: Amphibious – able to breathe underwater. History: The granddaughter of the Atomic Sub, Moray Talbot became a superhero in her own right when experiments with hydroglcerine enabled her to breathe underwater. Rather than have an android body like her grandfather, or a complete blood transfusion like their pet, Bubbles the sea-monkey, Moray simply takes a hydroglycerine capsule. This enabled her to extract oxygen from seawater for up to one hour, apparently without the side affects suffered by the Atomic Sub and Bubbles. 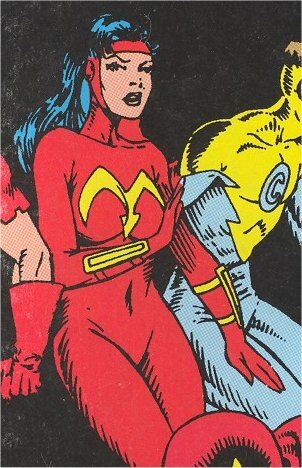 She had no other super powers, but seemed to be an expert oceanographer, and a strong swimmer. In her first appearance she travelled on the back of a tame whale. Moray and Bubbles became charter members of the Whizz Kids (the junior partners of the Round Table of America) and wre present when The Atomic Sub dies saving the world. She has a long standing romantic relationship with her fellow Whizz Kid, Cyclone. By the mid 1980’s, Moray had been missing for three years and (prompted by the death of Bubbles) Cyclone quit as leader of the adult Whizzards team to look for her. It has yet to be revealed what became of her.